This is, without a doubt, the best film I’ve seen at this year’s film festival. It was a moving, bittersweet film about a girl’s attempto to reconnect with her father. The girl is really a young woman, Ruta, a Lithuanian who escaped to Germany and to the US with her mother in 1945. Their father did not join them, staying behind in Lithuania, which was conquered by the Soviets and integrated into the Soviet Union after World War II. The girl has kept in touch with her father through post cards and the occasional telephone call, and now, when she is studying in Germany, he wants to meet her in West Berlin. This film takes place in 1961, months before the construction of the Berlin Wall. Berlin is a dangerous place, with people fleeing to the West, and being kidnapped to be taken to the East. 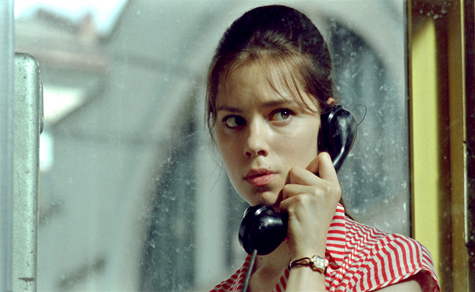 When Ruta prepares to meet her father at her friend’s home, two STASI men come instead, telling her that she must come to the East. Ruta becomes suspicious, and she is right to be so. The STASI, the secret police, are hoping to lure her into East Berlin, and kidnap her to take her to the Soviet Union, and are using her father as bait. The film is incredibly moving, because both the father and daughter are torn. The father does not want his daughter to be kidnapped, but he hasn’t seen his child in over 15 years! Ruta desperately wants to see her father, but she is very wary of a trap. I was so deeply moved by this film, directed by a Lithuanian. The film was very popular, due to the large Lithuanian population in Cleveland, and many of them turned out to see this film. The head of the Lithuanian consulate also introduced this film, and spoke about Lithuania’s struggle for independence over the past 200 years. This entry was posted in Uncategorized and tagged Cleveland International Film Festival. Bookmark the permalink. Sounds very moving, Emma. I hope it gets distributed & I’ll have a chance to see it! It’s a great film. You know, a lot of the films at the CIFF end up on DVD a year or two later, so if you don’t see it at an independent or arthouse cinema near you, check for DVD’s on Amazon or at the library in a year or so. Emma, thanks so much for this re-cap! I’ll have to look for this at some point–I have Lithuanian heritage, so this sounds especially interesting. (Had no idea Cleveland was a Lithuanian hotbed!) I hope it wins, too! Hope it comes out on video in the next few years so you can see it!